Location: In Georgetown follows to San Gabriel R connecting Lake Georgetown to Chautauqua Park. The San Gabriel River Trail is 6.6 miles long and follows the scenic North and South San Gabriel Rivers. The trail is eight feet wide and comprised of mixed surfaces including crushed granite, concrete, and asphalt. Along the trail you can see natural springs, historic features and animal tracks. The trail connects to United States Corp of Engineers trail at Lake Georgetown. Some interesting sites along the trail include star gazing area, bird watching area, the historic Blue Hole Park. 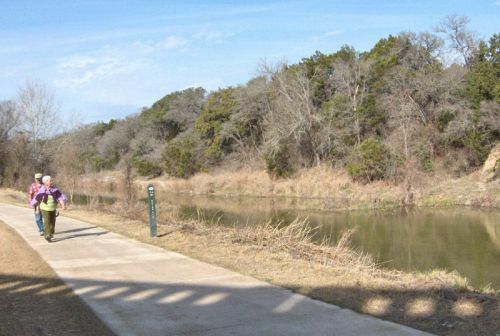 Trial users have said that the trail is very beautiful and unique to the area and even better than Town Lake in Austin. The trail system total cost was $3 million with grants from Texas Parks and Wildlife, Lower Colorado River Authority and the Chandler Foundation.